In my last post, I talked about using our signature print piece to determine brand messaging and design for all other media. In this post, I’ll show you how we took that design to the web. At the end, I’ll comment on how I now think the process should be reversed. While our communications team was in production on the viewbook package, a working committee was planning a new undergraduate admissions website. The committee was composed of representatives from Marketing and Admissions, and our web team (Trusted Web Solutions and Concordia). This dual process was and is a necessity because of the different user experience (UX) for web vs. print. Both media should invite the viewer/reader to an engaging experience, but the user comes to each experience with a different set of expectations, behavior, and options. We had our work cut out for us. We weren’t going to be able to build on previous admissions website success. 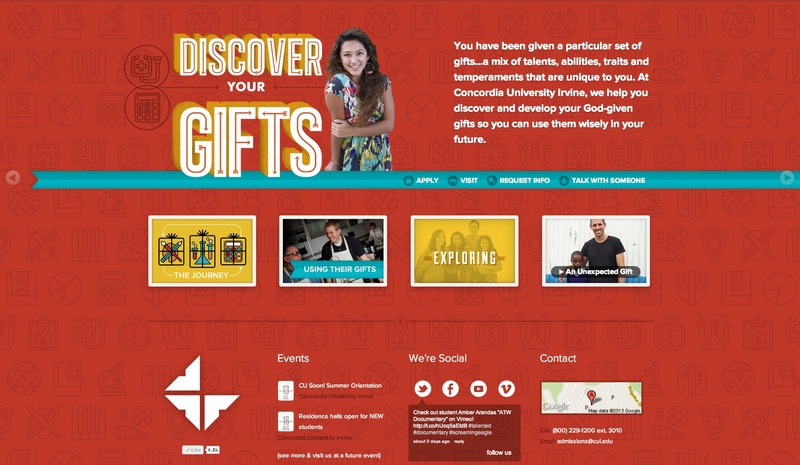 The admissions site we had at the time–a leftover from the previous web team design–was starkly absent of branding. It was designed for function, but it wasn’t engaging at all for an admissions funnel that needs a website that can keep interest over the course of months and years–a reality of undergraduate recruiting. We had researched what others had done and what we admired–namely the Notre Dame and Biola admissions sites–and we knew that we had to compete at such a level with limited resources. We also had the challenge of transitioning a design to the website that was created for a print user experience. My direction was clear: the brand messaging had to be consistent, and the design had to come across sufficiently enough so that the website and the print publications appeared to be in the same brand family. Beyond that, I wanted the web team to have creative license to produce something special. Build a microsite. We needed a site that would be specific to young Millennials. Just plugging content into our website template wouldn’t cut it. We needed an engaging experience. Bold design elements. Our web designers highly recommended bold elements in the design, a current and popular web design, and a clear departure from our print design. Sliding Screens. Our web design team recommended the use of six sliding screens relating to the viewbook sections about Concordia. These screens would allow us to carry across the brand messaging, and would create an engaging experience for the user. Connect prospects to real student stories. The new site needed to continue our successful storytelling initiative that largely relies on video. But we decided to go beyond that and shoot unscripted man-on-the-street videos asking students what they think about their major, something we hadn’t seen elsewhere. Responsive design. We made the decision to go with responsive design (RD) in spring 2011, and we launched the site in September 2011. For higher education, we were an RD early adopter and found ourselves defending our choice of RD over a mobile app to higher ed colleagues at marketing and web conferences. A year later, everyone was talking RD. Our admissions microsite may be viewed at http://www.cui.edu/undergrad. Leading the creation of the site was Mark Merrick, team leader; Jesse Inman, lead designer; Casey Sousa, designer; and George Allen III, content strategist. For comparison purposes, our viewbook may be viewed at http://www.cui.edu/admissions/undergraduate/discover-your-gifts/viewbook.aspx. We’ve been very pleased with our site. It’s worked for us at all levels of the funnel. While we had to pare back plans because of budget–specifically, the complexity of the wireframe–what we were able to achieve was a huge step forward for our admissions and branding efforts. But would I do it again this way? Would I use the print design to set the brand template for our web design? I don’t think so. While I know that print designers have traditionally set the brand design template, I think we’re now in a new era. Virtually every single prospect who checks us out views our admissions microsite, whereas only a percentage of them ever see our viewbook. I think I want to give our web designers more freedom to create a design for all of those visitors. If we decide to go out of house again for our viewbook package, we’ll need an agency willing to collaborate with our web design team on the brand template.